In 15 years of clinical practice I have seen dietary trends rise and fall, but one trend that I have seen steadily increase is raw-food veganism. Too often I see folks like this in my practice, who based on an ethical choice informed more by aesthetics, dogma and inference, have ended up doing real harm to their bodies. So in the interest of public health I am out to bust some myths around raw food veganism, in favor of an awareness that is more informed and nuanced. Quotes and research pulled from my new book, Food As Medicine. Humans evolved eating raw food. Raw foods contains enzymes necessary for digestion. Raw food has a higher nutrient content than cooked food. Wrangham R, Conklin-Brittain N. 2003. Cooking as a biological trait. Comp Biochem Physiol A Mol Integr Physiol. 136(1):35-46. Cooking destroys the healthy bacteria such as Lactobacilli. The vegan diet is higher in nutrients than non-vegetarian foods. Craig WJ. 2009. Health effects of vegan diets. Am J Clin Nutr. 89(5):1627S-1633S. Science has proven that the raw vegan diet is healthier. Still want to be a vegetarian? Weaver CM. 2009. Should dairy be recommended as part of a healthy vegetarian diet? Point. Am J Clin Nutr. 89(5):1634S-1637S Tapsell LC, Hemphill I, Cobiac L, Patch CS, Sullivan DR, Fenech M, Roodenrys S, Keogh JB, Clifton PM, Williams PG, Fazio VA, Inge KE. 2006. Health benefits of herbs and spices: the past, the present, the future. Med J Aust. 185(4 Suppl):S4-24. Comments? Love to hear them! Have you considered writing an article for the Weston A Price Foundation quarterly journal? First of all you make the assumption that everyone who eats raw food or is a vegan are eating the same food. There are many ways to be a vegan just as their are many ways to be a meat eater. If someone is eating McDonalds all the time and are unhealthy I could say that eating a meat based diet is unhealthy, you get my point. By suggesting that if one wants to become a vegetarian they consume copious amounts of dairy doesn’t make any sense whatsoever. Cows milk or for that matter the milk from any other mammal other than our own mother past the stage of weaning is completly unnecessary. We don’t have the ability to digest lactose past the weaning stage, that’s kind of a sign. 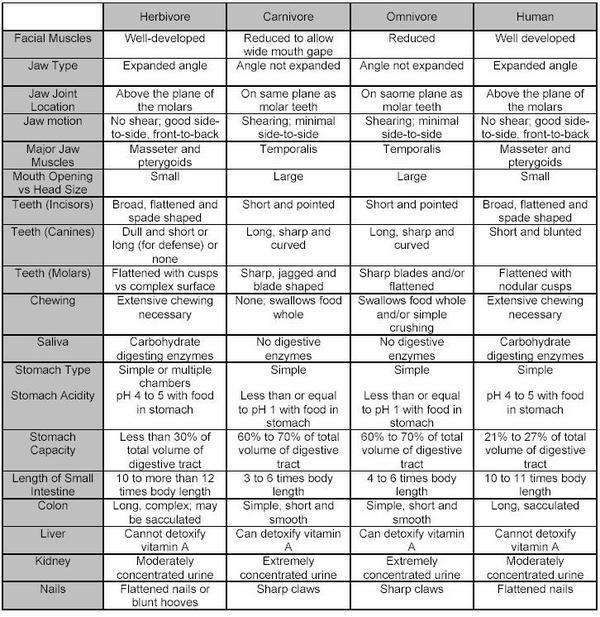 Check out this chart comparing carnivores, herbivores, omniovores and humans.http://glutenfreevegan.files.wordpress.com/2008/05/chart.jpg We live in a much different world than our paleolithic ancestors. They ate whatever they could to survive. We have the luxury to choose what is best for us now. I find it interesting that you say we’ve been cooking our food for more than a million years even though archeologists estimate that humans have been on the Earth for about 200,000 years. Why do most people (pychopaths not included) feel bad when they see an animal being killed, tortured, or suffereing? Why is it that when people actually see what is being done to animals before they get to the supermarket or your plate a lot of them choose to not eat them any longer? With 7 billion people on the planet raising aninals for food is very cruel and inhumane, destructive to the environment taking huge amounts of land, water and resources. 58 billion animals are killed each year for food. Something is wrong with that. I say that if you wouldn’t kill an animal yourself you shouldn’t be getting someone else to do it for you. Most people would find it strange to eat their dog. But why, pigs have been shown to be more intelligent than dogs. Why call one a pet and another dinner. Think about it. >>>First of all you make the assumption that everyone who eats raw food or is a vegan are eating the same food. There are many ways to be a vegan just as their are many ways to be a meat eater. I am not making any assumptions – there is simply no empirical evidence that even the most well-designed vegan diet is a sustainable diet, especially when we have a multigenerational perspective. The diet can’t be a diet that’s just good for skinny yoga people – it has to be a diet that feeds pregnant and lactating women. It has to be a diet that feeds children and their developing nervous system. >>>If someone is eating McDonalds all the time and are unhealthy I could say that eating a meat based diet is unhealthy, you get my point. No – that is an argument by analogy, not an actual argument. We are not talking about a McDonald’s diet, about which I am sure you and will agree. We are discussing the raw vegan diet. >>>By suggesting that if one wants to become a vegetarian they consume copious amounts of dairy doesn’t make any sense whatsoever. Cows milk or for that matter the milk from any other mammal other than our own mother past the stage of weaning is completly unnecessary. We don’t have the ability to digest lactose past the weaning stage, that’s kind of a sign. It makes lots of sense when we consider that the ONLY vegetarian culture on the planet are very much dairy-based. Spend any time in rural India and this will become abundantly clear. And despite what you say, humans DO have the capacity to produce lactase in adulthood. Not all populations have this ability, but people of European, Indian and African descent do. That is fact. >>>Check out this chart comparing carnivores, herbivores, omniovores and humans.http://glutenfreevegan.files.wordpress.com/2008/05/chart.jpg We live in a much different world than our paleolithic ancestors. Do you really expect me to take that chart seriously? First, it isn’t referenced, so one has to take it on face value that the person who compiled this chart knows what they are talking about. Are they an archeologist, a primatologist, or some kind of biologist, or are they just someone surfing the internet cherry picking whatever they like to imagine is true? And then when I look at the table, what am I to make of the delineation between “omnivore” and “human”? Humans ARE omnivores. And so are many species of insects, fish and birds, not to mention mammals like pigs and bears. Can one generalize about what an omnivore is? No, it is irrelevant. Thus the chart is thus irrelevant, because it creates a false paradigm of comparison. Humans evolved eating and cooking meat. There is ample evidence there if you honestly care to look. And we have been eating meat as a species for all of our evolution except for Hindu dietary practices in India that probably aren’t more than 2000 years old, and now of course, this most recent experiment in raw food veganism. Look – I don’t have an axe to grind or a philosophy to protect. My analyses are based on empirical evidence, clinical experience, human evolution and scientific research. Yours are backed up by a table with typos that is totally unreferenced. >>>I find it interesting that you say we’ve been cooking our food for more than a million years even though archeologists estimate that humans have been on the Earth for about 200,000 years. >>>Why do most people (pychopaths not included) feel bad when they see an animal being killed, tortured, or suffereing? Are you saying that butchers are psychopaths? I have friend that butchers her own chickens – is she a psychopath too? Do you see the problem with your reasoning? If we don’t accept your perspective, then we’re all psychopaths. But it sounds to me more like paranoia on your end. Humans in all cultures since the beginning of time have butchered animals. They did it, I grant you, with a much different mindset than is done today. In sanitizing the act of butchery, we have actually made the problem much worse, and incredible injustice has been done to living beings, not food animals, but entire eco-systems. Even the Hindu version of the 10 Commandments called the Manu Smriti (Laws of Manu) state that meat is an acceptable dietary item, as long as the act is done with reverence and respect. I believe that most traditional cultures all over the world maintain this same dignified respect for the animal. >>>With 7 billion people on the planet raising aninals for food is very cruel and inhumane, destructive to the environment taking huge amounts of land, water and resources. 58 billion animals are killed each year for food. Something is wrong with that. I say that if you wouldn’t kill an animal yourself you shouldn’t be getting someone else to do it for you. Most people would find it strange to eat their dog. But why, pigs have been shown to be more intelligent than dogs. Why call one a pet and another dinner. Think about it. Surely I’m not a psychopath. I like to know what my meat ate before I and my family eat it. I have this beautiful, stubborn, pushy, little bull that I got at 9 days old. His name is T-Bone. I feed him 3 times each day, soon to be 2 times a day as he is now eating grass. He has a task to do in 12 months and once he has done his task a couple of times (around age 2) he will be eating grass one second and “BANG”, dead the next. How can that be a problem? I would much rather have a pet that I eat, than a poor animal that has had to get rounded up and loaded onto a truck. Then it has to endure a scary ride to the saleyards, only to be unloaded and auctioned. The auction is a very noisy time. Then loaded into a truck again and taken to the abattoir with the smell of death. The guys loading and unloading are not always that gentle. The poor animal has not been fed since the beginning of the journey maybe 2 days or more in total. It’s tough going that way. The lack of stress and the fact that the carcase will be hung for 5 to 7 days, before being cut up, will make for the best tasting meat ever. The only nasty bugs will be the bugs that one animal has on him. Compare that to being killed one day after spending 2 days in stress and hung overnight before being cut up. Only one animal needs to have E. coli or something like this to spread to dozens of others (no cleaning of knives between each carcase). Nothing to do with an unbalanced mind here. I’m happy to take responsibility for a death that is stress free, clean and quick. It is not a “pleasant” task and it only happens once every two years. I can well understand those who don’t have the guts to do it themselves, becoming vegetarians (but not vegans) because they don’t like the processing system for meat. The organic meat processing system does do it better (well at least tries to). The comment by Chris “we don’t have the ability to digest lactose after weaning” shows a lack of knowledge. Only maybe 10% lose the lactase enzyme so the “evidence” is again skewed. Just an aside, I ate dog in a restaurant in Timor, it was good! (I didn’t know at the time I ate it or I may not have).